Central Park, Metropolitan Museum of Art and Madison views abound! Nestled in a tree lined townhomes street, 40 East 80th is located on the corner of Madison Avenue and 80th Street. 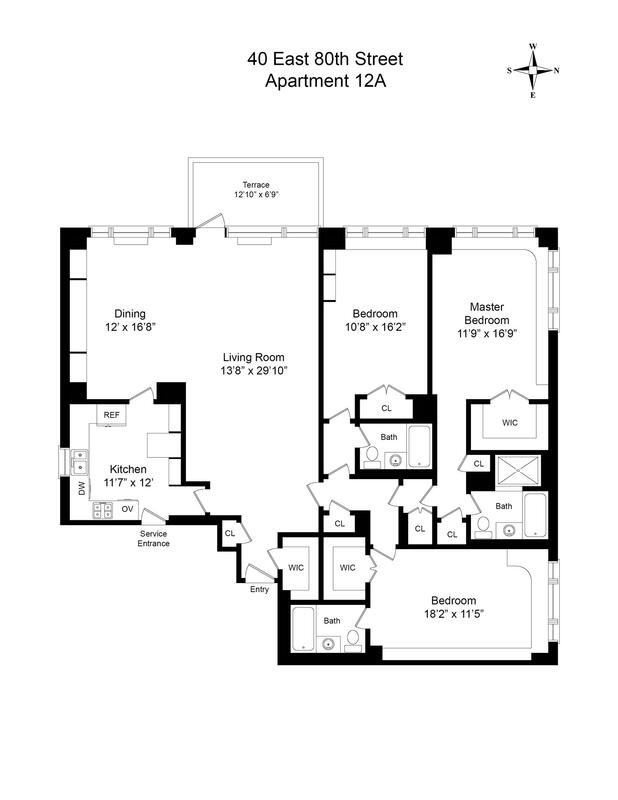 Residence 12A is a spacious 3-bedroom, 3-bathroom with a balcony. A large eat-in kitchen with top of the line appliances: Sub-Zero and Thermador, will inspire the inner chef in you, perhaps a rendition of Alain Ducasse or Julia Childs, to whip up a savory dish. There is a nice separation of entertaining and bedroom wings. The master bedroom is situated on the northwest corner of the building absorbing the western sunlight and great views both North and West into Central Park. Both the master bedroom and the second chamber enjoy the privacy of en-suite bathrooms that have been fully renovated. The third bedroom with an updated bathroom, allows your guests full access without interruption of the penetralia of the bedroom wing. All three bedrooms were thoughtfully designed with voluminous layouts and amply sized closets, including three large walk-in closets, two in the bedrooms and one in the foyer. Washer and Dryer hookups have been installed, and is allowed.Walk to your favorite attractions in the Upper East Side including Central Park, the MET, or the fabulous shopping corridor of Madison Avenue: Ghurka, Rofer Vivier, Moynat, Hermes, Ralph Lauren, Tom Ford and the likes. Perhaps a casual stroll to some of the finer dining establishments such as Serafina one block away, Sant Ambroeus, Café Boulud, Café Carlyle, or Bemelmans Bar. Public transportation includes both the cross-town 79 and the uptown M1, and M2 stops one block down on 79th Street. PS6 is just one block away. This luxury co-op permits 75% financing, Guarantors, Co-purchasing, pieds-à-terre and is a pet friendly residence. Welcome to your new home!